One of the earliest design goals for the core combat system of Legends was to find an elegant way to combine fast pace with strategic depth. We believe we have achieved this balance with our lane system. To get the fast pace we were looking for, we utilized a direct-attack mechanism. There’s a lot of kinetic satisfaction in slinging your cards across the board with immediate feedback, not having to wait for your opponent to respond. Prophecy is the one exception and our feature on Prophecy cards goes into details on how that works and why. The other goal – strategic depth – is somewhat at odds with a fast-paced direct-attacking structure. 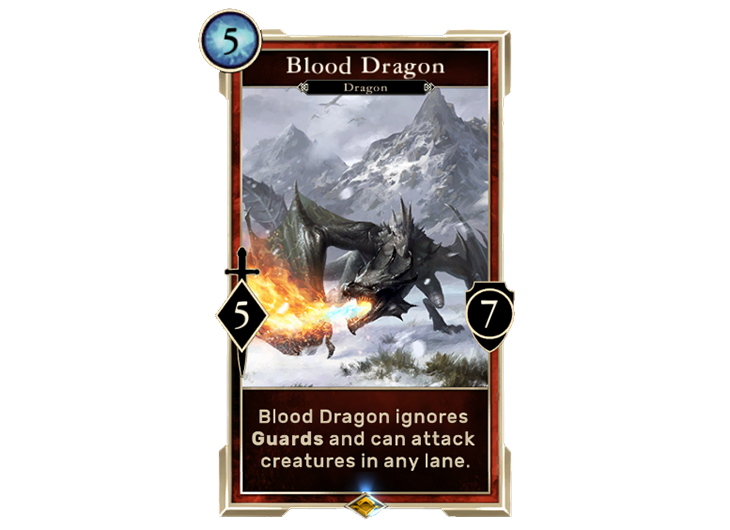 If we put strategically interesting abilities on cards, it can be hard for players to build decks around those creatures if they can be easily attacked and killed. 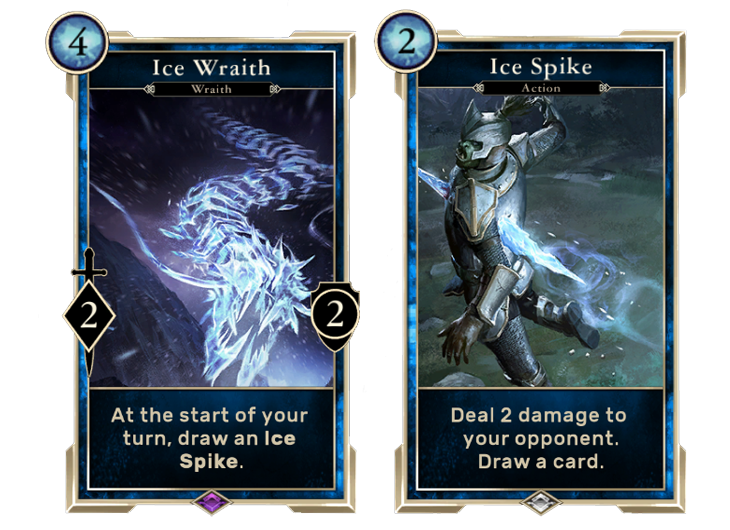 A card like Ice Wraith is a good example. 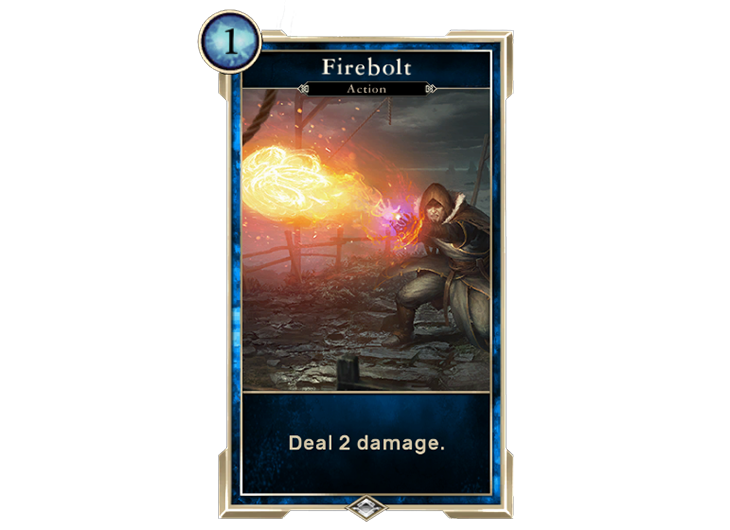 It’s potentially very powerful if you can keep it alive, but with 2/2 stats, it’s easily taken out by an opponent’s attack. We wanted to build a game engine that gave vital creatures like an Ice Wraith a reasonable – but not assured – chance of surviving in a direct-attacking world. This is where lanes come in. Let’s talk about the actual rules of lanes as they’re used in Versus games. The battlefield is separated into two lanes. Each player can have up to four creatures per lane. When a creature is played from hand, the player must decide which lane to put it. A creature in one lane can’t attack an enemy creature in another lane. The left lane is called the Field Lane. There are no special rules associated with it. It’s an unrestricted lane where creatures can fight each other with ease. The right lane is called the Shadow Lane. Unlike the Field lane, this lane comes with a built-in special rule: any creature summoned here gains Cover, which protects it from attack until that player’s next turn. 1. Two lanes make it twice as difficult for one player to command complete control over the board. This property is fairly intuitive; if both players receive the same number of cards and get the same amount of magicka (the resource used to play those cards), then even if one player gets the better draw, that player is unlikely to get such a great draw that they dominate both lanes with “big bully” creatures. 2. It’s easy to have one turn of relative safety. Because of the Shadow lane’s special ability, just about any creature can have one turn of protection from enemy attacks by being placed there. Let’s imagine the Ice Wraith player had a terrible starting draw and has virtually no board presence by the fourth turn. Even in that tough luck case, the player has a place to play the Ice Wraith knowing that it will gain Cover and be safe from attack…for now. Providing components (two lanes, cover) that can be used to keep your cards safe from attack is just one piece of a bigger system which altogether tries to provide viable strategies for many types of decks. We value checks and balances and believe there should be counter-strategies against every approach. This led us to design the Cover rule in the following way: Cover DOES protect a creature from being attacked. It DOES NOT protect against spells and special abilities. 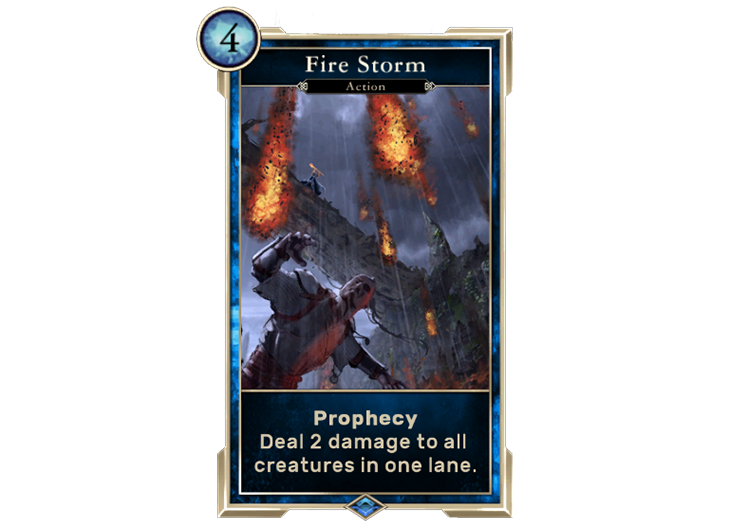 Cards like Fire Storm imply a lot about the game’s strategies. Players may naturally find themselves building up a strong presence in one lane, but lane-wide spells can discourage that approach, which leads to more interesting decisions and player interaction. And this ties back to the goal about strategic depth. It’s not just about the lanes, it’s also about the cards available for you to build with. What are you choosing to do with your deck? What do you think other players are up to with theirs? Can you out-strategize your opponent? These are all fun questions to think about and there are no simple answers because of the depth of the game.